The Blowout Sax is the way that many many students have been revitalized and fallen back in love with the sax when they have ‘hit the wall’ ie feel they can progress no further. And this too is a calling for all saxophone players who are bored witless of being taught by a ‘straight’ saxophone teacher and also want to enjoy playing again.After 22 years experience we are the best at Blowout Sax at this.We teach all ages and abilities. To back up our proud boasts check out these testimonials. ‘After a few years classical sax and grades at school can get extremely boring. But I was pushed into trying another teacher. After one seriously enthusiastic phone call from Mark I came in and started doing some reggae. We’ve covered reggae blues funk even some Soul Makossa and now I’m trying with Mark Archer’s guidance to put my own original sax track together. 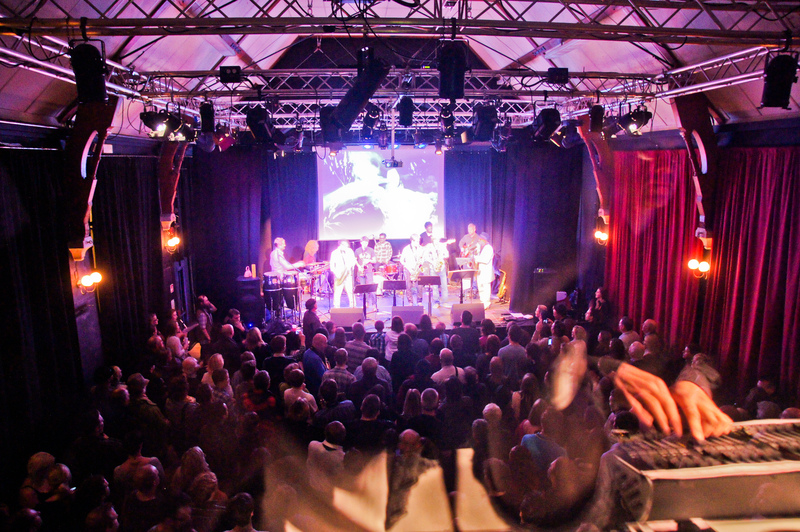 I get to play good tunes, that I want to play. 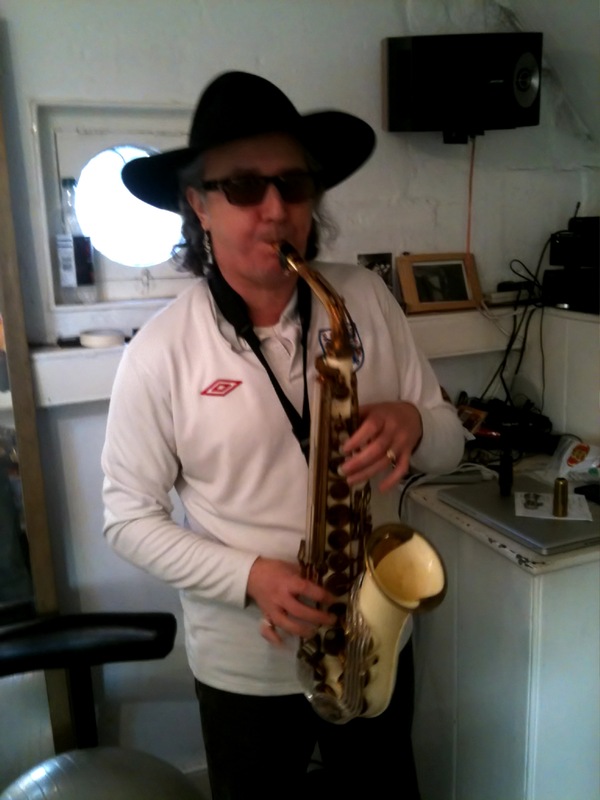 Mark s a great laugh and I’ m back to enjoying my sax.’ Dave Busse. monotony of the pieces, along with the unnecessary pressure of grading. that it wasn’t the teachers that were the problem, but the music itself. Recently I had the great fortune of playing on a good condition Grafton saxophone at Blowout Sax brought in by Suzie.It is an injection moulded, cream-coloured acryli c plastic alto saxophone with metal keys, which was manufactured in London by the Grafton company, and later by ‘John E. Dallas & Sons Ltd’. Only Grafton altos were ever made, due to the challenges in making larger models with 1950s plastic technology. Production started in 1950 and ended ten years. Grafton saxophones have a very distinctive appearance due to their 1950s Italian style. The mechanical action of Graftons has an unusual “spongy” feel to it, without the quick, “snappy”, positive feel of other more conventional saxophone actions. The plastic technology used in the Grafton dates from the late 1940s and is therefore nowhere near as robust as the injection moulded plastics used in the 21st century. The basic problem with Grafton saxophones is thatparts of them could easily crack, fracture or snap off during normal use. Not only do Graftons use a non-standard spring mechanism to operate the action, but spare parts are unavailable. Not surprisingly, Graftons are challenging and expensive to overhaul or repair when compared to saxophones made entirely of metal . As a general rule, Graftons are now regarded purely as collectors’ items i.e. for display purposes only. This is because they are fragile and very easy to damage, which detracts from their monetary value. A sales representative for Grafton asked Parker to use a Grafton for a Massey Hall gig in May 1953 as once again Charlie ‘Bird’ Parker had pawned his saxophone. Although Parker was under exclusive contract to use only one type of saxophone whilst gigging in the United States, outside the U.S.A. he was free to use any sax he wished, including this Grafton. The recording of Parker can be heard on the CD “Jazz at Massey Hall”. The Grafton saxophone that Parker used (serial number 10265) was sold at the Christie’s London auction house in September 1994 for £93,500, though this was because of its association with a famous jazz musician rather than the instrument itself having any special merit. The buyer was the American Jazz Museum, located in Parker’s home town of Kansas City. Ornette Coleman used to play a Grafton purchased in 1954 originally because it was the cheapest saxophone he could replace his first tenor with after it was broken. In the late fifties and early sixties, Coleman was known as “the man with the plastic horn”. However, Coleman subsequently replaced his Grafton with a white-lacquered Selmer alto instead. 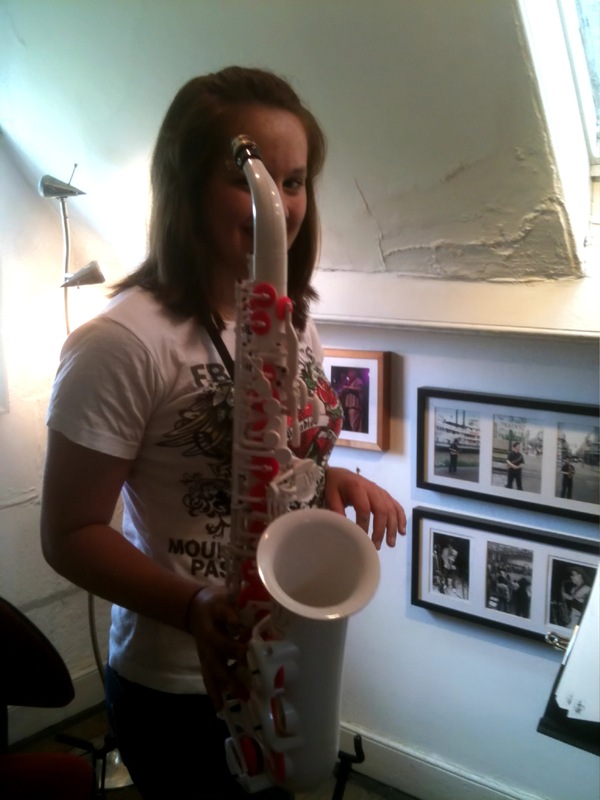 As of 2010 there are no manufacturers of plastic saxophones, with the exception of Vibrato Sax.Here’s Lowri with her pink version of the Vibrato Sax.It is incredible light and from a young beginners idea excellent but it still is a tad expensive as a new costing over £300 from www.sax.co.uk.On playing it is light and tonally satisfactory but improvements could still be made in the mechanism which I imagine can only be a matter of time. Lowri has now graduated onto her dads lovely black and gold alto sax now. Plastics technology has advanced significantly since the 1950s. Superior polymers now exist which are much more durable, not to mention the possibility of using composites of the carbon fibre for component parts requiring extra strength so watch out for more and improved plastic saxophones in the 21 century. 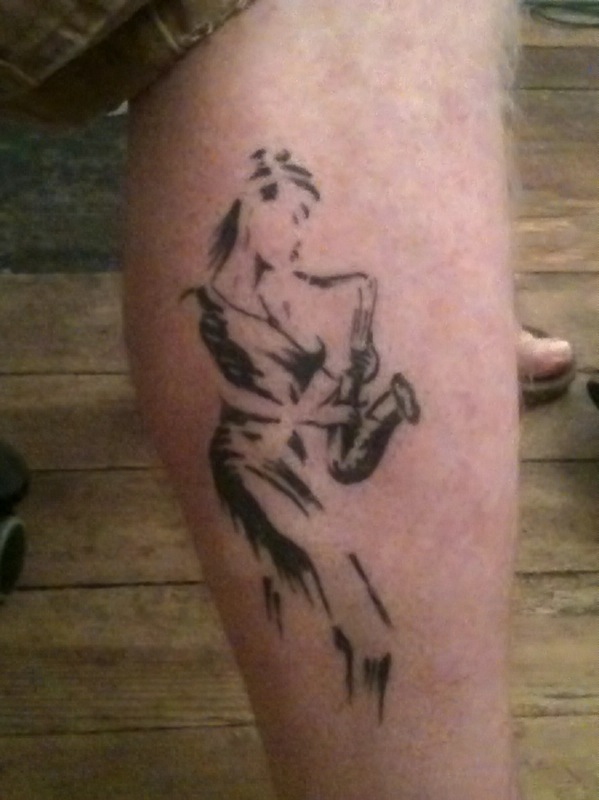 Mr Paul Jones a huge saxophone player and longtime Blowout Sax stalwart decided to have this created on his leg forever .That’s eternal love! “1958 Dearman President Haunted Tenor Saxophone” read the Ebay.co.uk listing, buy it now for £150 was an opportunity too good to be missed. So off we set one sunny May Saturday to collect this mysterious instrument. Unsure as to whether he would be at home when we arrived, the owner, Chris Shaw who had played with amongst others Showaddywaddy, had left a note saying that we were coming to collect “Frank”. As it happened Chris was in and began to regail the story of “Frank”. Chris told us that he had used the sax as a back up to his Selmer when gigging abroad and it was often mistaken for a Mark VI itself. However he always had problems when playing it, strange quirky things would happen, a bit like the sax had a mind of its own! When telling a friend of his who was also a minister in a Spiritualist Church about the odd goings on he asked if he could hold the sax. As soon as he held it he said that there was a spirit attached to the saxophone and his name was Frank, a polishman who lived in London and died in the 1970’s of lung cancer. Frank had been given the horn by an American Jazz musician named Waylon Williams who just like Chris had used it as a spare. Through his friend Chris and Frank then started to talk about the sax and in particular the way that Chris was now looking after it. Frank was not impressed at all with the fact that Chris had re-laquered the instrument and got really annoyed that it was no longer being covered in oil – big question mark over what he meant by that!! Frank got so upset with Chris that he ended up saying that the sax would never be his and never play for him! So after fruitless attempts to get some melodic sense from the sax now known as Frank he put him on ebay. I have to say that Frank has performed for me albeit with the occasional oddity, although I guess that could just be me!!! 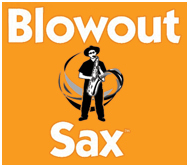 Come to The Blowout Sax School and learn by ear no musical knowledge required ! 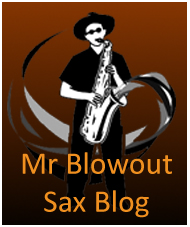 Mark Archer on A Sincere and Insightful Recommendation on Blowout Sax : A Revolutionary Approach To Learning The Sax. nealburton on A Sincere and Insightful Recommendation on Blowout Sax : A Revolutionary Approach To Learning The Sax. Toni on A Sincere and Insightful Recommendation on Blowout Sax : A Revolutionary Approach To Learning The Sax.